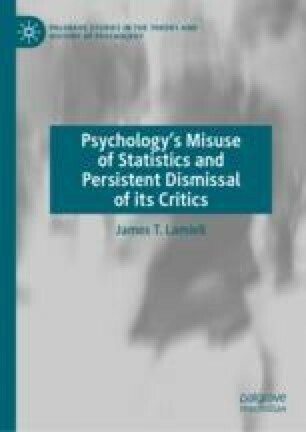 This chapter discusses how aggregate statistical methods of investigation made their way into scientific psychology via the portal created by the establishment of a subdiscipline devoted to the systematic study of individual and group differences in various aspects of human psychological functioning. Two textbooks authored by William Stern (1871–1938), one published in 1900 and the other in 1911, were of major significance in the founding of this subdiscipline, called ‘differential’ psychology. The 1911 text, reflecting Stern’s more developed view, emphasized the distinction between population-level statistical knowledge about variables with respect to which individuals have been differentiated, on the one hand, and, on the other hand, knowledge of the individuals who have been differentiated in terms of those variables. However, other influential contemporaries of Stern’s such as E. L. Thorndike (1874–1949) and Hugo Münsterberg (1863–1916) did not adopt Stern’s view on this matter, and it was then ignored in widely-read differential psychology textbooks authored by Anne Anastasi (1908–2001) and Leona Tyler (1906–1993). Thus did the notion that statistical knowledge of populations is also knowledge of the individuals within those populations became entrenched among investigators of individual and group differences. The chapter concludes with a brief discussion of Stern’s ever-growing concerns over the direction in which differential psychology was moving.